The ending couldn’t have been more drastic on the final day of the NRM New Zealand National Jumping and Show Hunter Championships 11 February. Thick rain overnight and throughout the day made for extremely testing conditions. The mud was thick, riders were sweating and some came away with tears, both happy and sad. The most challenging course of the day was the Dunstan Horsefeeds & Equifibre NZ National Grand Prix Horse Championship in association with Wilcox Perlas Potatoes. The final class struggled with the cut up turf; however Australian Course designer John Vallance found new ground for each fence and built a solid track for the brave riders. The first round was a battle of survival with no one achieving better than two rails down. Four combinations added eight faults to their speed round score. Local hope Harry Feast retired Double J Bouncer, who found the footing too difficult to jump out of. In the final round everyone picked up a time fault, opting not to cut corners with the chance of a slip or stumble so high. Dicavalli Don Quattro tried his heart out for Dani Maurer in the final round, adding just five faults to give them a total score of 22.87. 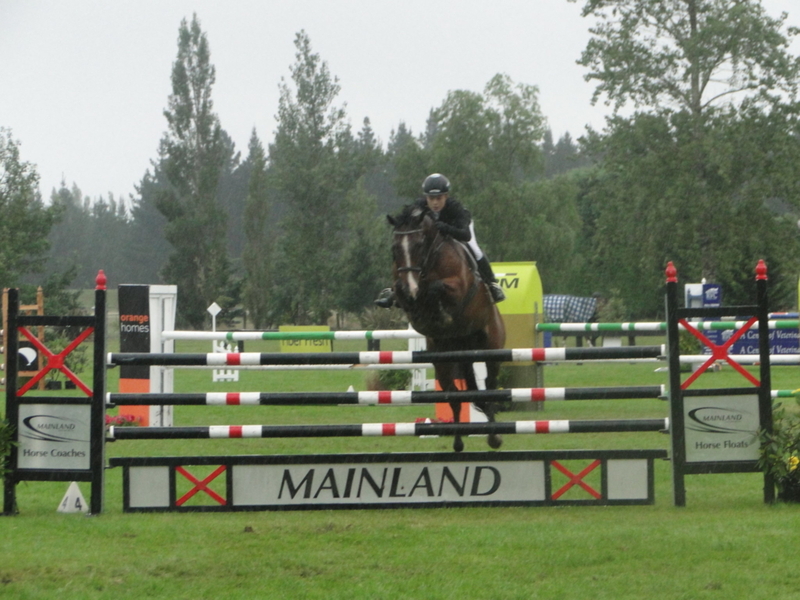 Steffi Whittaker and Chris Harris followed with nine faults each to drop below the North Island rider. Nicole White and LC Samson found themselves in the lead after Lucinda Askin opted not to start Portofino on the final day. With two rails in hand going into the final round White kept her composure. Ironically she took out a brick on the sponsor’s Wilcox Perlas Potatoes wall, but rode with determination and commitment to keep the rest up and claim the prestigious win. The most heartbreak came in the Fiber Fresh NZ National Pony Championship. Three scratchings, two retirements and one elimination proved even the ponies didn’t cope well in the mud. There were no clears in the first round of the competition, with just three collecting four faults. In the final round, eight-faulter Sophie Scott applied the pressure by coaxing a clear from her pony Benrose Playtime. Next out Rosa Buist-Borwn completed a fantastic clear round on her super consistent pony Junior Disco. Grace Manera aboard Rednalhgh Cowan followed with a rail at fence two, a jump that had caused many problems over the day, to drop her behind Buist-Borwn and Scott. Olivia Adams was last to go and under pressure things didn’t quite go to plan. After notching four faults the win was handed to a delighted Buist-Brown, claiming the title and following in the footsteps of her older sister Molly. 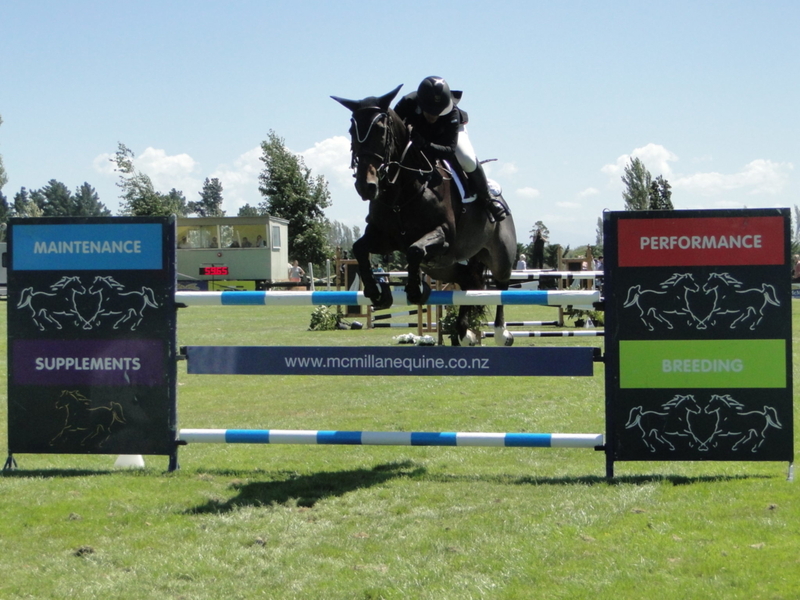 Very deserving riders were rewarded in the McMillan Equine Feeds NZ National 1.30m Horse Championship. Maurer who had travelled all the way from Auckland was bound to take her share of the glory and took out this class with her relatively new ride Madam Coco owned by Cerys Tarr. After adding just four faults to her speed round score she finished 2.44 faults ahead of Angus Taylor and Oak As. Taylor has worked tirelessly as the chairman of the Nationals committee and thoroughly earned his second placing. Third was taken out by veteran Alacazam MH in the hands of Tegan Fitzsimon, a time fault in the final round costing them the runner up position. Maurer also placed fourth on Banderas C to round out an extremely successful class for her. The rankings were juggled substantially on the final day in the Mainland Coachwork Ltd NZ National 1.20m Horse Championship. Just one rail moved Olivia Brown and RH Kukumoa from sixteenth after the speed class to third overall. The major mover was Zoe Shore aboard Burberry completing the only double clear of the day to move from twentieth to second place. Last to go in the final round was Lauren Buckley and Icey Storm, who had the pressure of Shore only 1.08 faults behind. Buckley handled the heat to produce a wonderful clear, much to the delight of her proud mother and generous supporter of local jumping, Kay Buckley. Grace Percy and Sunny Disposition won the Hilton Press NZ National 1.10m Horse Championship due to her outstanding start in the speed round on day one. They were the only combination to lead from start to finish in the championships. The following five place getters also finished on their speed score, proving how important the first day is with the new shortened format. In the Zilco NZ National 1.10m Pony Championship Ella Rae-Wood and Tallyho Primrose were one of just two combinations to jump double clear on the final day to claim the biggest win of her career so far. The new addition T&M Nurseries Ltd NZ National 1m Pony Championship was well supported. Young Samantha Gillies juggled winning in the Show Hunter classes with competing two ponies in this class. She finished on her original score with He’s Sweet As to jump ahead of speed leader Pippa Collins and Pixel, who had to settle for third due to a rail in the final round. Ruby Taane and Kennebrooke Jester also jumped ahead from seventh to second as a result of a double clear. 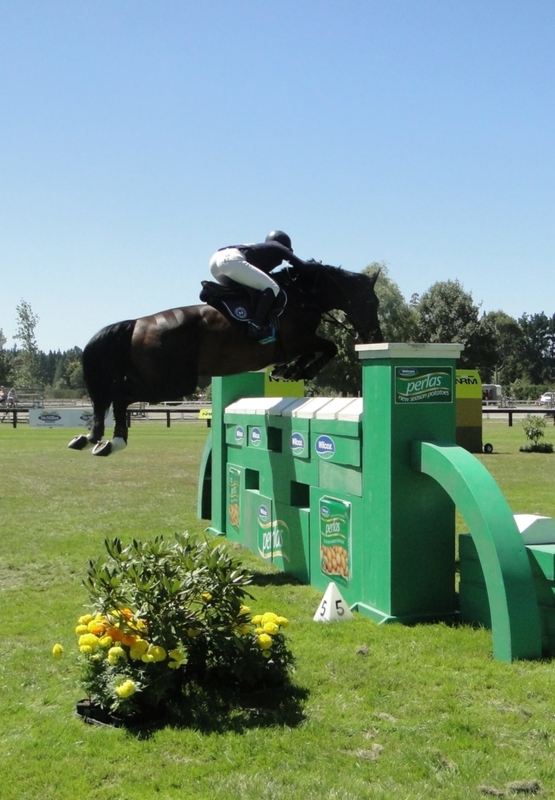 Although the final day was a less than ideal ending to the show, the NRM New Zealand National Jumping and Show Hunter Championships still provided quality competition for riders and spectators alike. The hard working committee pulled off yet another fantastic event and the riders who waded through the mud and worked up a sweat, ended up with tears of joy. Overall Dunstan Horsefeeds & Equifibre NZ National Grand Prix Horse Championship in association with Wilcox Perlas Potatoes: Nicole White (Invercargill) LC Samson 1, Dani Maurer (Auckland) Dicavalli Don Quattro 2, Chris Harris (West Melton) Glenbrooke Archie Bunker 3, Steffi Whittaker (Springston) Eros K 4, Kimberleigh McCabe (Invercargill) Kace 5. Overall Fiber Fresh NZ National Pony Championship: Rosa Buist-Brown (Burnham) Junior Disco 1, Sophie Scott (Wellington) Benrose Playtime 2, Grace Manera (West Melton) Rednalhgih Cowan 3, Grace Manera (West Melton) Tallyho Scoundrel 4, Olivia Adams (West Melton) Mr Black Magic 5, Sophie Geddes (Tai Tapu) Te Ngaio Raggamuffin 6, Rebecca Wardle (Hokitika) Dingmac Disco King 7, Jordan van Miltenberg (Southland) Harrison James 8, Pippa Collins (Palmerston) Waiotahi Belle 9, Georgia Allison (Oxford) Pioneer High Jinx 10. Overall McMillan Equine Feeds NZ National 1.30m Horse Championship: Dani Maurer (Auckland) Madam Coco 1, Angus Taylor (Ohoka) Oak As 2, Tegan Fitzsimon (West Melton) Alacazam MH 3, Dani Maurer (Auckland) Banderas C 4, Todd Magner (West Coast) Awatuna Jonesy 5, Susie Hayward (Rakaia) Andretti 6, Sally Spicer (West Melton) Bella Vi 7, Tamara Silcock (Nelson) Steel Magnolia 8, Rik van Miltenberg (Southland) Truly Unique 9, Nicole White (Invercargill) Lil LeRoux 10. Overall Mainland Coachwork Ltd NZ National 1.20m Horse Championship: Lauren Buckley (Queenstown) Icey Storm 1, Zoe Shore (Ashburton) Burberry 2, Olivia Brown (Milton) RH Kukumoa 3, Grace O’Sullivan (Sefton) Cosmopolitan 4, Olivia Harkerss (Leeston) Lacona Ammoe 5, Kate Beattie (Dunedin) Smartymarty 6, Grace Percy (Glenorchy) Kiwi Spirit 7, Abby Hore (Millers Flat) Beaumont Geldolf 8, Mary Wakeman (Tuahiwi) MJ Lubeck 9, Nicole White (Invercargill) Flash Back 10. Overall Hilton Press NZ National 1.10m Horse Championship: Grace Percy (Glenorchy) Sunny Disposition 1, Amy McMullan (Timaru) Silversmith 2, Olivia Orange (Prebbleton) La Fontyn 3, Jessica Fahey (Invercargill) Repertoire ll 4, Country Thompson (Christchurch) Arovet Li 5, Margaret Ridley (West Melton) Tallaght 6, Rachel Beattie (Dunedin) Midnight Magic Rumble 7, Candace Kingsbury (Ashburton) Miss Serendipity ll 8, Emma Waite (Ashburton) Renoir NZPH 9, Rachel Beattie (Dunedin) Lowlands Schnapps 10. Overall Zilco NZ National 1.10m Pony Championship: Ella Rae-Wood (Greymouth) Tallyho Primrose 1, Olivia Adams (West Melton) Sweet Cappuccino 2, Noah Coutts (Dunedin) Onisha 3, Meg Bisset (Marlborough) Freestyle Twyst & Shout 4, Polly Harper (Oamaru) Buckle Up 5, Olivia Harkerss (Leeston) Cocamo 6, Eloise Beattie (Blenheim) Demi Quaver 7, Harriet Stock (Ashburton) EB Esperenza 8, Amanda Shallard (Timaru) Earnest 9, Dan Harkerss (Leeston) Double J Yippee 10. Overall T&M Nurseries Ltd NZ National 1m Pony Championship: Samantha Gillies (Oamaru) He’s Sweet As 1, Ruby Tanane (Ohoka) Kennebrook Jester 2, Pippa Collins (Palmerston) Pixel 3, Emma Gillies (Oamaru) Paint Me Puzzle 4, Leah Zydenbos (Darfield) Mt Tulloch Royal Falcon 5, Madeline Haugh (Cheviot) Tallyho Blue Masquerade 6, Samantha Gillies (Oamaru) Moccachino 7, Beth Coleman (Canterbury) St Elmos Fire 8, Madeline Haugh (Cheviot) Get Rhythm 9, Skye Somerville (Cheviot) Fairburn Cosmic Star 10.